on-line - you are currently connected to the world server. off-line - you are not connected to the world server (messages and other changes will not be sent). disconnecting - you are disconnecting from the world. reconnecting - you are not connected to the world, but a connection is trying to be made. You can click on the connection status word to find out more about your connection. If you lost your connection to a world (if the world was been shutdown or your Internet connection has been lost), clicking on the status word will ask if you want to try to reconnect. 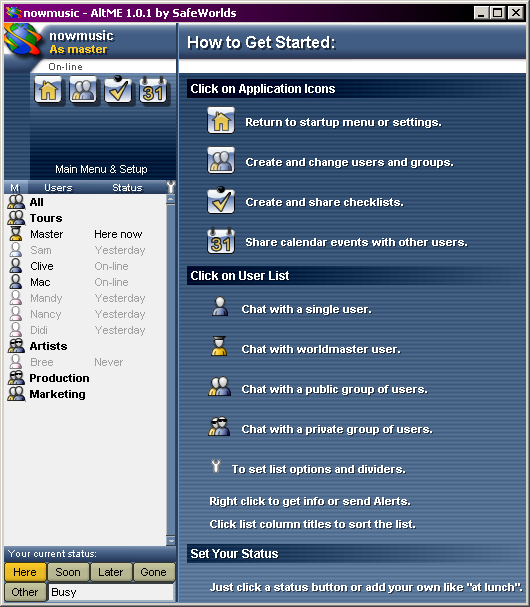 Each of these icons will take you to a different application and change the view displayed in on the right side of the main window. There are three icons, but as more features are added, more icons will be displayed. Users and groups - shows you a list of users and groups and lets you find out more information, create, or delete users (if you are the Worldmaster). Checklist directory - shows you a list of checklists. Main menu - takes you to back to the main menu (the one you see when you first start AltME). As you move your mouse pointer around on the screen and over specific items (such as the application icons), this line will display a brief message about the item. This is an easy way to find out what something does without referring to this user guide. The user list shows you the names of users and groups who are in the safeworld that you are visiting. The user list is shown in order of most recent messages sent to you. That is, the person or group that most recently sent you a message will be put at the top of the list. As new messages are received the order of the list changes to show that. This automatic ordering is very useful. It makes it easy to keep track of who you are chatting with, and helps you keep track of serval converations at the same time. Everyone who you are actively communicating with appears at the top of the list. If you want to see the list sorted in other ways, just click on the labels at the top of each column. You can sort the list in three ways. 3. 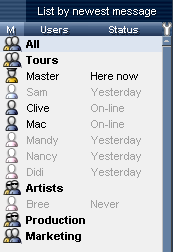 Clicking on the Status label will keep the list sorted by active user status. The user who is most active will appear at the top, and all the groups will be shown at the bottom. 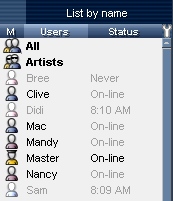 If you click on a user name or group, you will see recent messages displayed in the right side of the window. 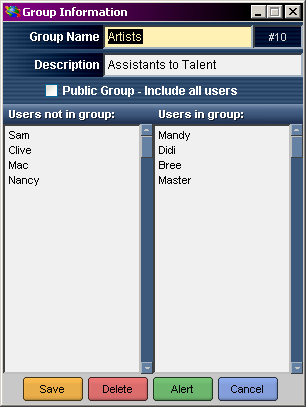 If you right click on a user or group, you will see detailed information about that user or group. This shows you details about the user or group. See the User and Groups chapter for more information about these panels. Users who are currently on-line and actively using AltME (within the last 60 seconds) appear as dark, normal image and text , and users who are not online appear with faded image and text. If a user is "here now", then they are actively using AltME and chances are good that you can contact them. 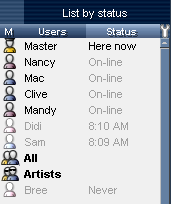 After a few minutes, if the user is not actively using AltME, you will see their status switch from "here now" to "on-line". 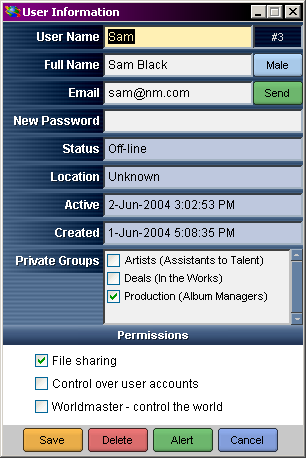 This indicates that the user is still connected to the world, but is not actively using AltME. Their status is not known, because they did not set it, but the system does know that they are still connected to the world. If a user name or group name appears red, then you have received new messages from that user or group, and you can click on the name to see the messages. Each user can also control a short status message that tells you more about what they are doing. You can tell others your status by using the status panel in the lower left. You can click on one of the four preset status buttons, or you can provide your own custom status message. Soon be back soon - if you are going to be back in a few minutes. Later be back later - if you are going to be back in a while, between a few minutes and a few hours. Gone gone - if you expect to be away from your computer for more than a few hours. If you have set the Soon, Later, or Gone buttons, and you send a message, the system will automatically switch you back to Here Now status to keep other users from wondering how it is that you can send messages if you're not there. You can set a custom status message to tell users more precisely what you are doing. When you do, the custom message will be shown to all other users, and will not switch back to Here Now status on its own. And anything else people can imagine.